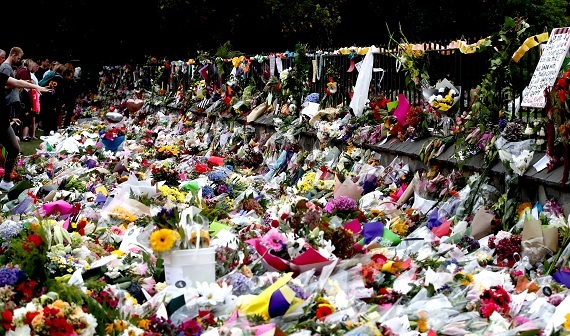 Flowers and tributes are laid at the Botanic Gardens on March 18, 2019 in Christchurch, New Zealand (Photo: Hannah Peters/Getty Images). Bangladesh’s Test cricketers were just a few minutes from being caught up in last week’s massacre in New Zealand when they arrived at a Christchurch mosque as shooting began, a team spokesman said. In a chilling account, Khaled Mashud described how most of the Bangladeshi team drove up to the Masjid al Noor in a bus just as the attack got underway. At least 49 people died in attacks on two mosques during Friday prayers in what appeared to be the worst assault on Muslims in a Western country. “We were very close, we could see the mosque. We were maximum 50 yards away. I would say we are very lucky,” Mashud told reporters in Christchurch. Mashud said about 17 Bangladeshi players and team staff on the bus watched as blood-soaked victims staggered from the building. “It looked like video, what we usually see in a movie. From the bus we saw bloodied people coming out of the mosque,” he said. “We were in the bus about eight to 10 minutes. We kept our heads down in the bus, in case of any firing (towards them). A Bangladesh cricket reporter posted footage of grim-faced players walking briskly from the scene as a police car with sirens wailing speeded in the other direction. Bangladesh Cricket Board spokesman Jalal Yunus later said the team were “shocked” but unharmed and had been ordered to stay in the team hotel. “They are safe. But they are mentally shocked. We have asked the team to stay confined in the hotel,” Yunus said. “Just escaped active shooters!!! Heartbeats pumping badly and panic everywhere! !” posted Bangladesh high performance analyst Shrinivas Chandrasekaran. The third and final Test match of Bangladesh’s tour, scheduled to start in Christchurch on Saturday, was quickly scrapped. As condolences poured in for the victims and their families, All Blacks centre Sonny Bill Williams, a devout Muslim, said his “heart is hurting” and posted an emotional video tribute. “Inshallah (God willing) everyone who’s been killed today… you guys are all in paradise,” he said, wiping away tears as he spoke. The All Blacks, New Zealand’s all-conquering rugby team and the reigning world champions, tweeted: “Christchurch, we stand with you during this time. Wales captain Alun Wyn Jones, whose team is coached by New Zealander Warren Gatland, also sent a message of support. As a minute’s silence was held at the Chiefs v Hurricanes Super Rugby game, a New Zealand derby, Indian cricket captain Virat Kohli called the killings “shocking and tragic”. His dismay was shared by Pakistani cricketer Mohammad Hafeez. “Shocked to see the visuals of shooting inside Christchurch’s Mosque. Are we not even safe inside places of worship now?” he tweeted.